We finally stumbled upon another Bigfoot variant. We know, some people like to call them species but semantically this is not correct. In order to classify these variants as different Bigfoot "species" we would need to have substantial biological information to classify with any kind of taxonomy. So we like to use the word Variant until we have a base model(captured Bigfoot) to reference. Today we are have added the Moehau to the ever expanding Bigfoot Lunch Club AKA Bigfoot World Map. Moehau are depicted as being as tall as a man, completely hair covered, with marginally ape-like facial features. The primary difference from human appearance being the extremely long fingers, tipped with sharp talons, capable of tearing apart the toughest prey. 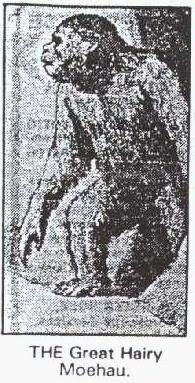 The talons seem at odds with most descriptions of Bigfoot, but it is not the first time a variant has been described with talons. Many areas of New Zealand are named for these great hairy man beasts, Moehau Mountain, where they are believed to reside and people are cautioned against going up there is one such place. The Moehau are thought to populate both Mount Tongariro and Ruapehu, the Karangahake Gorge, Coromandel Ranges, Martha Mine Region, Waikaremoana – in the Urewera Ranges, The Heaphy River of the Northwest Nelson State Forest Park, Kaikoura Mountains, Fiordland National Park and are believed to be very common in the Haasts Pass area particularly around the Haast River.